Recent American Fulbright alumnus Tom McFadden undertook an extensive tour of New Zealand primary, intermediate and secondary schools in May and June to promote the Science Idol competition, an initiative he developed as part of the 2012 New Zealand International Science Festival to engage young people in science through the creation of songs and music videos on scientific topics. Tom came to New Zealand as a 2011 Fulbright US Graduate Student to study science communication at the University of Otago, where he is still completing his two year Master’s degree. He has a particular interest in popularising science with students in the digital age, which builds on his own underground YouTube fame as a “science rapper” under the pseudonym The Rhymebosome. Tom first married his twin loves for hip-hop lyricism and biology to create a series of music videos aimed at inspiring undergraduate science students at Stanford University, where he was a tutor prior to his Fulbright exchange. In New Zealand Tom has shifted his focus to younger students, particularly those in the intermediate age group which has been identified as a time during which students are particularly vulnerable to losing interest in science. The energetic repertoire he has developed for this audience includes an autobiographical introduction written to the tune of South Auckland rapper Savage’s song “Swing”, and the popular “Fossil Rock Anthem”, a geology-themed interpolation of American pop duo LMFAO’s chart-topping “Party Rock Anthem” with complementary fossil-digging dance moves. Tom’s promotional tour for Science Idol, organised with the support of the US Embassy, saw him perform at 22 schools in Auckland, Wellington, Christchurch and Dunedin, to an estimated 4,000+ students. 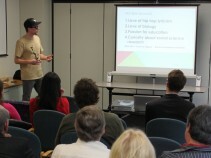 He also held an informative public seminar at the Fulbright New Zealand office about his unique research and teaching methods, and made many media appearances in newspapers and on radio and television. Tom’s efforts generated 27 entries of music videos to the Science Idol competition across three age groups, which can be viewed online at www.scifest.org.nz/idol. Winners in each age group received an iPad and the grand prize winner, 16 year old James Mustapic from John McGlashan College in Dunedin, won the opportunity to professionally remake his song and video in Dunedin and perform live at the New Zealand International Science Festival. Tom described the Science Idol initiative as “an exhausting but exhilarating few months”, in which he was impressed by the “creativity and scientific swagger” of the many New Zealand students who participated.